Meet Dr S. P Singh One Of The Best Physiotherapists In Kanpur. As part of our new Series BrilliantStory, where we shortlist and feature the inspirational stories of successful entrepreneurs. This month, we bring to you the motivational story of Dr S.P Singh (Kanpur). We were lucky enough to get some of his time out of his extremely busy schedule on a Monday morning. Our Team reached his Kanpur Office where we interviewed him for our Online Magazine. He was kind enough to answer a few of our questions so that we could understand how he overcame all the obstacles and made his presence felt in the Physiotherapy industry. In such a short span of time and in an industry where there is cut-throat competition as well as a lack of certified professionals, Dr S P Singh set a benchmark and created a success story of his own. Who is Dr S P Singh? Dr S P Singh is a renowned Physiotherapist from Kanpur. He has won many awards and has received many certifications. He is known to have amended certain protocols and recommended introduction of fair practices in physiotherapy. Dr S P Singh is a certified professional with the following certifications from around the world. He has travelled the length and breadth of the country to people from all types of pain. Dr S P SINGH has cured over 25000 patients with chronic pain so far in India. 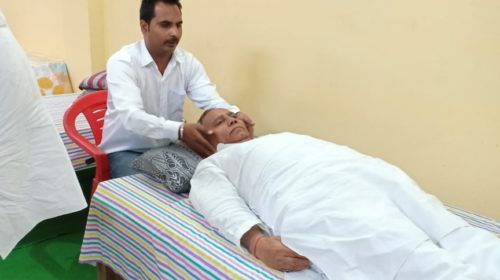 He has offered treatment to many renowned personalities and celebrities as well. Sr. Editor – BrilliantRead: Sir, You have achieved huge success whithin a short span of time, what drives you? Where do you get your motivation from? DR SP SINGH: I look at people working so hard irrespective of their status, caste or creed and that motivates me everyday. I draw infinite inspiration from my parents, specially my mother. It is very satisfying to see the smile on her face when she hears about my success. This is just about 20% of what I planned to achieve. I still have a long way to go. Sr. Editor: How do You overcome failures, dejection and disappointment? DR SP SINGH: I’m no stranger to failures, I have failed quite a few times and there was no failure that did not teach me to become stronger. In fact, whatever I am today is because of the failures that taught me to be more resilient in the face of adversities. I’m always ready to embrace failures and ensure that they don’t affect my enthusiasm, my thoughts or my actions. I always come back strongly with more confidence and preparation so that I can encounter tough situations with a stronger zeal. Sr. Editor: What were the challenges you faced initially? DR SP SINGH:The journey was extremely difficult initially, but then as we discussed, there is no difficulty & no failure that can’t be overcome. My journey has been tough and I was always prepared to combat any challenge thrown my way. I even challenged a few protocols which were not in the best interest of our patients. So I fought for it and managed to change the protocols. This feat made me feel proud of my efforts because not everyone is keen enough to take up such a challenge. Not everyone is willing to come out of their comfort zone and hence they get complacent easily. I have been lucky enough to be able to avoid. Sr. Editor: How do you keep yourself committed to helping everyone and curing patients across India? What is your purpose? How are you so passionate about physiotherapy? DR SP SINGH (Kanpur): The only reason I chose this profession was to help people, cure them and help them in achieving a better lifestyle. Seeing them overcome their disease makes me happy which in turn makes my mother extremely proud. So I would love to keep helping people for as long as I can. Sr. Editor: Sir, What would you advice the youngsters and over 50000 readers of this online Magazine? DR SP SINGH: First of all, I am thankful to BrilliantRead for considering my story, so Thank a lot! My message for all the readers of BrilliantRead as well as the youngsters, is to not get demotivated by failures. They must rather learn from it and come back more strongly. I would also encourage them to spend their time in productive thinking and in the company of the positive people. Spend some time on personal development, believe in yourself and keep moving forward. I wish everyone All the best! Great success ahead sir…. god bless uh a lot.